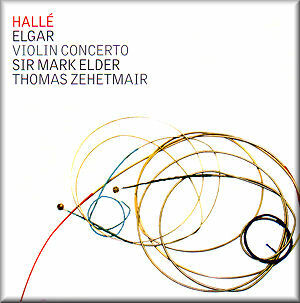 Those collecting the Hallé’s Elgar series will know that each disc features at least one unusual item to set it apart from its competitors. The present disc begins and ends, rather incongruously some might think, with extracts from two of Elgar’s oratorios. The prelude to The Kingdom opens with music almost as impetuous as that of In the South, but later passages bring significant contrast, with several, richly scored passages of great lyrical beauty. The version given here features a concert-ending by the composer that you won’t find in the oratorio score. It receives a superb performance, one which has made me impatient to hear the whole work again, something I haven’t done for many years. The extracts from The Dream of Gerontius came into being as a result of requests from Henry Wood, amongst others, who wanted to programme music from the oratorio in purely orchestral concerts. Like Wagner with Tristan und Isolde, Elgar chose to arrange the beginning and the end of his mighty work. Michael Kennedy’s notes, which, as ever, get directly to the heart of matter, tell us that Elgar worked on this arrangement towards the end of 1900 and conducted a performance with orchestra alone in February of the following year. Four days later, Wood conducted the same arrangement but included the vocal part of the closing pages. The choral parts are omitted, and to my ears the orchestral parts seem to have been subject to relatively little modification. Alice Coote is most moving as the Angel. She sings with a calm radiance that would reassure – I think – even the most timorous soul, with only the slightest trace of vocal hardness on one or two high notes. The Prelude is sober and serious. The recording dates given are identical to those of Elder’s complete recording of Gerontius. For all I know, the Prelude, at least, may simply be an extract from the complete recording. I have not yet heard that performance, but this disc has prompted me into action, and I have ordered it today. With that in mind, plus The Kingdom, I clearly have some large-scale Elgar listening to look forward to! The orchestral introduction to the Violin Concerto, all three minutes of it, is played with enormous conviction and authority by the Hallé. Mark Elder’s mastery of the ebb and flow of the Elgarian pulse now seems complete, albeit more Boult than Barbirolli I would say. The soloist’s first entry is forceful, but leads to a long, held pause which creates a strikingly powerful, sombre atmosphere. The rest of the movement alternates between the tenderness and forcefulness the score demands, but one is left with the feeling that Zehetmair wants to bring out the violent side of the work’s passionate nature rather than its inward quality. This is certainly a valid view – this is a true, virtuoso concerto – and many will be convinced by it. All the same, I feel there is something missing here. It’s not that Zehetmair’s playing lacks tenderness. The second subject, for example, is beautifully done, and like all the lyrical passages, features a kind of portamento playing which puts one in mind of Menuhin. Elder certainly matches his soloist blow by blow: the orchestral tutti half way through the movement is surprisingly violent, and the closing pages communicate something close to desperation, making the opening of the slow movement even more a haven of peace than usual. Even here though, the soloist’s entry, marked mezzo-forte and cantabile, is delivered with an intense vibrato giving it an anguished quality. There is a refusal to linger from all concerned throughout the movement, and just as there are one or two rough patches from the soloist in the more taxing passages of the work, so he shows himself occasionally willing to sacrifice beauty of tone in favour of a real fortissimo in this slow movement. His way with the rapid semiquavers which open the third movement brings some heaviness, despite the fact that it is marked to begin softly. On the whole this finale is dispatched with great drama and conviction, but then there is the famous cadenza to consider. As we know, the score carries a inscription to the effect that the work enshrines the soul of ….. - five dots being the only clue as to the identity of the soul incarnate. Elgar revealed that it was a “she”, but no more than that. Those amongst us – the present writer included – who are irritated by this kind of thing, readily admit, nonetheless, that there is something intensely personal in this work, and in the accompanied last movement cadenza in particular. Is it not here that the composer is in closest communion with the soul in question? If so, the performers must bring out the intimate nature of the discourse, its almost secret quality. We might wonder if we aren’t intruding, except that the thoughts and feelings the composer is communicating are powerful and vivid without being explicit, which is, of course, the great and glorious power of music. Zehetmair plays this cadenza superbly, but just misses this mood, to my ears. He doesn’t quite cast the spell, and overall this is what I feel is lacking in an otherwise immensely fine performance. Many will welcome the strong, virile approach, as I also do, but it doesn’t seem to be the whole story. It is a reading I will come back to often, but I won’t always want to hear Elgar’s concerto this way. I admire Hilary Hahn’s DG reading very much, and Pinchas Zukerman with Barenboim on Sony even more. Menuhin never figured amongst my favourite violinists, and he is technically fallible in his performance with Boult and the New Philharmonia Orchestra, recorded by EMI in 1965. But I do think he comes closest, in all the recorded performances I have heard – and I haven’t heard them all – to penetrating the secret of this wonderful concerto.